In an attempt to bury the reality of radioactive fallout and pretend that everything is okay, the Japanese government is now planning to redistribute hundreds of millions of cubic meters of radioactive soil from the Fukushima nuclear disaster site to public parks throughout the country. Soil contaminated with radioactive cesium is currently being shipped throughout Japan and used to prop up roads and tidal banks, and it’s about to get even worse. The Ministry of the Environment and its advisory council are planning to buy the contaminated soil directly from the Fukushima nuclear disaster site so they can hide it in future public landfill projects. This is how the Japanese government plans to clean up the radiation – dilute it underfoot and disperse it in the many communities throughout the country. Radioactive waste is about to become a permanent pollutant, slowly infecting the Japanese way of life. A University of Tokyo environmental engineering professor, Yuichi Moriguchi, estimates that there are roughly 100 million cubic meters of contaminated soil, which is enough soil to fill 80 large stadiums. In the summer of 2016, the Japanese government began recycling contaminated soil with radioactive cesium measurements reaching 8,000 becquerels per kilograms. Tons of contaminated soil has already been mobilized to build tidal banks and national roadways. The newest rule allows this toxic soil to be used in public parks as long as it is covered by a layer of topsoil, vegetation, or concrete. Notably, Cesium-137 has a 30-year half-life and persists in soils for 200 – 300 years. It’s hard to tell where all this radiation will end up over time. Once it’s dispersed throughout the country, it could ultimately end up in water and food sources for decades to come. After the contaminated soil is dispersed in a public works project, the Japanese government says that area residents are expected endure less than .01 mSv of radiation a year. Apparently, exposure to radiation is the new normal in Japan, and the government suddenly “knows” how much is safe on a yearly basis. The Ministry of the Environment also plans to organize a new public relations task force to convince the people that this method of recycling is safe. They pledge to cover the contaminated soil with a layer of vegetation, according to government guidelines established in 2016. The Japanese people should be worried that this cesium will begin to leech into the ground water and be taken up by the vegetation. 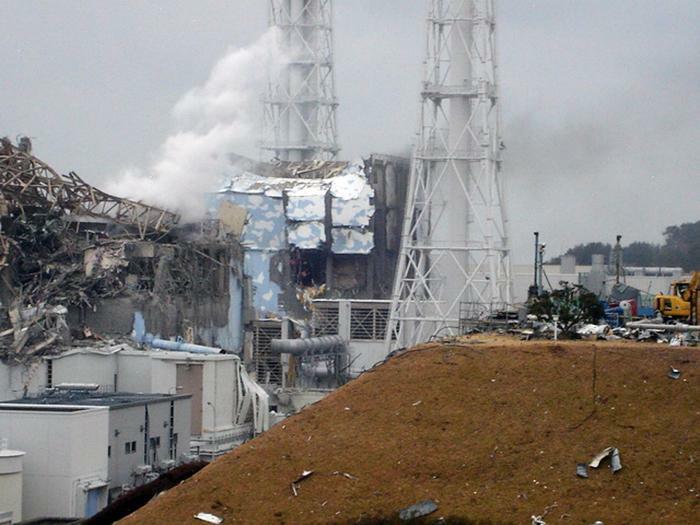 Instead of implementing strategies to remove cesium from soil, food, and water, the Japanese government plans to take the easy way out and try to bury it, out of sight, out of mind. They have no strategy to protect the people from cesium exposure. Their strategy spreads the problem and mirrors the policies of the US EPA when it comes to managing biosolids from human wastes. Raw sewage or toxic biosludge is being redistributed in much the same manner. This toxic city waste, full of heavy metals and pollutants, is repackaged as safe fertilizer and spread on farms across the US countryside. As government and polluters try to cover these horrifying problems up, their strategies will burden the human race for generations to come.